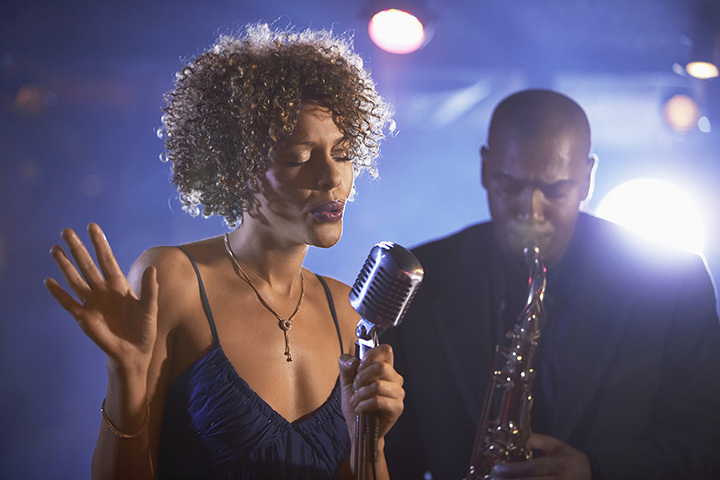 10 Jazz Clubs that are a "must-visit" for every music aficionado! Louis Armstrong famously said, "If you have to ask what jazz is, you'll never know." Well said. But over the decades, there are a few things we have learned about this uniquely American art form. Jazz evolved out of the spirituals sung in African-American churches, the brass-band funeral processions of New Orleans, ragtime piano, European music and a thousand other influences. It is a wholly original musical "gumbo." The term "jazz" is credited to a vaudeville team who first uttered it onstage in 1910, while the first jazz recording -Livery Stable Blues by the Original Dixieland Jazz Band - was made in 1917. Since then, jazz has evolved to include artists from Armstrong, Ella Fitzgerald and Glenn Miller to Miles Davis, Wynton Marsalis and Harry Connick, Jr.
Great jazz can be found in dozens of cities across America. But these are the legendary clubs any true fan must visit. Might as well start with the city that is considered the de facto birthplace of jazz. Preservation Hall opened in 1961, originally as an art gallery. Unemployed musicians would play there for tips, and it quickly morphed into the place to go to hear authentic jazz. Located in the French Quarter, Preservation Hall has embraced its role in "preserving" the traditions and history of New Orleans jazz. Seats are available on a first-come-first-served basis, and fans (even former president Jimmy Carter) have been known to sit on the floor! This unassuming structure is the world's oldest continually operating jazz club. It first opened in 1933 as a humble sandwich shop. By 1939, the owners were booking jazz pianists - and in the early '50s, artists like Art Tatum, Erroll Garner, Nat King Cole and Dave Brubeck were regulars. The Lounge is known for its great acoustics and intimate seating (only 99). You'll also dig the tilted mirror over the keyboard, which gives a great view of the artist's hands. But plenty of non-pianist musicians have passed through over the years, too, including Ella Fitzgerald, Cab Calloway and Miles Davis. In 1986, Baker's Keyboard Lounge was designated a Historic Site by the state of Michigan. Located in Greenwich Village, this windowless basement room began as a speakeasy during Prohibition. Eventually, it morphed into a space for music, poetry readings, comedy and more. In 1957, it became an "all jazz" venue, and the location for several landmark albums including Sonny Rollins' A Night at the Village Vanguard and John Coltrane's Live at the Village Vanguard. Theolonius Monk, Miles Davis and Dizzy Gillespie are among the legends that've performed there - as the extensive photo collection on the wall attests to. Established in 1949, the club's name was inspired by the legendary Charlie "Bird" Parker. Just five years after it's opening, well over a million and a half people (including Frank Sinatra and Marilyn Monroe) had flocked there to hear artists like Dizzy Gillespie, Count Basie, Theolonius Monk and many more. These days, Diana Krall, Pat Metheny and Michael Brecker uphold the club's slogan as "the jazz corner of the world." It is literally located in an alley off Wisconsin Avenue in our nation's capital. For fifty years, this unassuming club has showcased jazz artists like Ramsey Lewis, Oscar Peterson, Grover Washington, Jr., Sarah Vaughn and Stanley Turrentine. Even their Creole menu items are named for jazz giants. Part of their mission is to assist young performers in the area through various outreach efforts. Al Capone once hung out there - which explains the trapdoor used for quick escapes from the frequent police raids (its now used for deliveries). This legendary space opened in 1910, and retains much of the flair of days past- like bullet holes in the walls. Though not as high profile as some other Chicago jazz clubs, its beloved by fans for its devotion to showcasing both established artists and new ones who are taking the music in surprising directions. This elegant club regularly appears in the Top 12 of Downbeat magazine's listings of the best jazz clubs in the world. There's live music four nights a week, and a Monday night jam session that attracts local players. Even minors are admitted (when accompanied by an adult). Also, the American Jazz Museum is right next door. It's an unassuming dive bar with only three items on the menu. But it also regularly serves up some truly tasty music. The "Pec," as locals call it, first opened in 1933 as a cantina for the Mexican workers flocking to the city. In the '50s, Jack Kerouac slouched in one of the booths to hear music by artists like Count Basie. The tiny stage has even hosted then-candidate Bill Clinton and his saxophone. Since opening in 1970, this cozy club has been the destination for L.A.-based "musician's musicians" like Larry Carlton, Andy Summers and Kevin Eubanks. It's perhaps best known for the "jazz fusion" style - not to mention, its extensive menu of (you guessed it) baked potatoes! It's a sushi restaurant that is also one of the most respected jazz clubs in the country. Yoshi's added live music in 1977, and has since become a must-play place on the West Coast for artists like Branford Marsalis, Max Roach and Joe Williams. It's known for its excellent sound system and table layout, which guarantees a great seat, no matter where you sit. There's also a San Francisco location, but Oakland is where it all began.